A couple of weeks ago, we announced the PowerEdge C6145 system made up of two servers crammed into a 2U enclosure with a total of 96 cores. Today that system officially became available for purchase. Dell (NSDQ:Dell) has really outdone itself. On Tuesday, the company begins shipping a machine that the CRN Test Center can only describe as 2010 Server of the Year squared. Officially called the PowerEdge C6145, Dell’s latest monster server more than doubled the Geekbench score of the reigning champ, the Dell R815. Talk about dense. 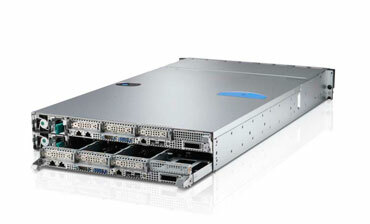 Dell’s new PowerEdge C6145 server stuffs eight AMD Opteron processors in a single 2U enclosure, making it a standout for high-performance computing (HPC) and, potentially, virtualization…By way of comparison, Dell called out Hewlett-Packard’s eight-way ProLiant DL 980 G7, which has 8U and takes up four times as much space as the Dell box. This is especially important in HPC environments, which, in their scope, tend to put a premium on footprint. This will be extremely useful for companies that want to attach lots of storage or networking to server nodes in dense configurations, or those who want to cram in a lot of cores into a box and lash them to lots of external GPU co-processors. This entry was posted on Tuesday, March 1st, 2011 at 10:51 pm and is filed under Uncategorized. You can follow any responses to this entry through the RSS 2.0 feed. You can leave a response, or trackback from your own site.